Want to fry your Thanksgiving turkey indoors? Gas turkey fryers are a no-no when it comes to your kitchen. A new electric fryer on the market decreases the chance of burning your house down. We can’t buy and review everything, but luckily Consumer Reports can. 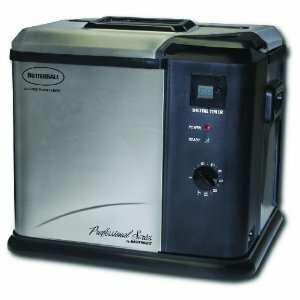 They have recently reviewed the Masterbuilt Butterball Professional Series Indoor Electric Turkey Fryer. It can also be used as a steamer. Remarkably, it’s designed to hold a turkey weighing up to 14 pounds… although they tested it with a “snugly fit” 12 pounder. Getting it up to cooking temperature was a little slower than I have found with gas, but it uses less oil (2 gallons as opposed to about 3). Their conclusion? It failed as a steamer, but worked well as a fryer. Their test turkey was brown and very juicy, but created oily thighs. To me, this would be a sign that the temperature was not hot enough, but an electronically controlled thermostat should have taken care of that. Their full review can be found at Consumer Reports and a video of the ordeal–that seems goofy when you think of how respected they are–is below.